Genndy Tartakovsky has amassed a passionate fanbase by creating the Cartoon Network programs Dexter's Laboratory, Samurai Jack, Star Wars: Clone Wars and Sym-Bionic Titan, and now he's made the leap to the big-screen with Hotel Transylvania. It's not quite the theatrical debut his audience was expecting, given that he's been long-attached to audacious projects like a Samurai Jack movie and a sequel to Jim Henson's The Dark Crystal entitled Power of the Dark Crystal. And his career is taking another surprising turn with his next project: directing a 3D animated feature adaptation of E.C. Segar's iconic comic strip hero Popeye. His new take on the sailor man is another example a burgeoning partnership with Sony, and as the L.A. Times reported, expect his Popeye to be as "artistic and unrealistic as possible." While speaking to Moviefone on his promotional trek for Hotel Transylvania, Tartakosvky gave further insight into what fans can expect from his new Popeye interpretation, as well as provided updates on the status of the Samurai Jack film and the possibility of a Dexter's Lab movie.1. Tartakovsky's Popeye is done in the style of Max Fleischer. For me, it's the original early '36 to '40 range of the Fleischer Popeye cartoons. I think since they were based out of New York, it was very different. I don't want to say underground, but it was more racy, more edgy. 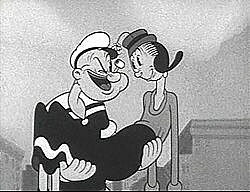 And I think while everyone was warming up to Disney, Fleischer made huge marks in animation, with Popeye, Betty Boop and Superman. They were doing amazing stuff and for me it's the exaggeration and the silliness, the laughter, the movement, the physical comedy. And that's one thing I'm after for Popeye. It's the whole reason I agreed to do the feature; I said "If I'm going to do this, I want it ten times more physical and crazy than we did in Hotel and ten times more character." And [Sony] were like, "Alright." The funny thing is that CGI was designed to mimic reality, but I'm going to use this realistic tool in a completely different way. 2. Don't count out the Samurai Jack film, just yet. It's been eleven years since Jack came out, but it's still kind of in the ether. People talk about it and I still get emails if someone mentions something. Doing all this press that I've been doing, it's amazing how many people mention it and ask about the movie. I feel like it's good timing. 3. But don't expect him to ever revisit The Dark Crystal. I haven't heard from the Dark Crystal people in a long time, so I feel that's gone. 4. Same goes for a Dexter's Laboratory movie. I have considered it but the original voice of Dexter retired and I can't foresee doing Dexter without her. 5. Tartakovsky hopes to change the concept of American animation. For whatever reason, I think we have one type of animated movie and it's so wrong. I want to do a drama, I want to do an action, a comedy. In live-action, there are all sorts of movies. There's independent movies, big movies, action movies, funny movies, and for us we have one movie. And there is no reason why we can't have the same range as live-action. It has proven itself in other countries and I think we need to be a little bit more original with our storytelling and graphics for America and American audience.